Image Courtesy of Living Magick. Here we are again folks, but I’m happy to say I’m back on track. You may recall that last month I confessed to doing just about nothing with my cool Living Magick tarot learning cards, despite committing to working on it just one month prior. I may lack discipline, but at least I’m honest. This month I did a much better job of working with the flash cards, but it was frustrating because I’d forgotten much of what I had learned in November! So January was about relearning the Major Arcana, and I’m pleased to say that with regards to that I’m now in good shape. 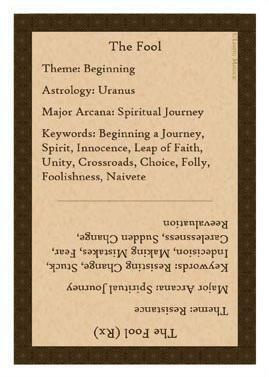 I know the general theme of each card, its astrological association, and some other keywords associated with each card. Once you remember the general theme, the keywords are pretty easy to recall since they’re generally off shoots of the general theme. The astrological associations were a bit tougher until I remembered what I had learned from “The Magical I Ching” by J.H. Brennan. To help you remember the trigram itself, I noted that it was broken at the bottom. There are few things you could imagine quite so rude as breaking Wind from your bottom. I know, I know, this sort of image is thoroughly unsuitable for a sober tome on a spiritual oracle…but you’ll never forget that trigram now, will you? And by the way, if you must break wind, do it gently. That way you’ll remember the other title of the trigram. I love me some Brennan! Now Living Magick’s tarot learning cards do not have images, which I rather like because these days who knows what image will appear on any given card of any given deck. However, I was still able to use absurd associations to help learn the astrological signs for each card. For example, the astrological association given for The Fool is Uranus. I immediately thought about how young kids (and well, many adults) will always chuckle at Uranus. You said Uranus…heh, heh, heh. So obviously a fool says Uranus. Is it sound logic? No. Has it worked? Yes. More bizarre still was while learning a favorite card of mine, The Hanged Man, its astrological sign is Neptune. What odd string of logic did I use to remember this? The Hanged Man’s legs are generally drawn with one leg straight and the other bent. It’s kind of trident-esque and the trident is often depicted with the god Neptune. It’s totally weird and embarrassing to admit to, but it’s getting the job done. I’m not sure if I’ll be able to apply this “logic” to learning about Cups in the Minor Arcana, but I’ll obviously let you know how it goes. And again, thanks to Living Magick for the great deck! It’s a real boon for a beginner like me!